I know this. I accept it. The way I know this is because apparently I gave birth to a fashion expert. She KNOWS what is fashionable and what looks good, and what DOESN’T. And she loves me enough to tell me. Each and every time. Quickly. Without hesitation. And with, at times, extreme disgust. Like today we were shopping at the GW Boutique where Cooter found a Halloween costume (already, yes, he’s only been talking about it for a month). It’s just about hoodie weather here now (any day now, please), and I like to look and see what fantastic hoodies they might have. It’s like a game. A treasure hunt. We were walking through the men’s section (you can find the best hoodies there), and I saw an Oxford shirt that reminded me of one I used to sleep in–it had belonged to one of Mess Cat’s old boyfriends and thus, she had passed it along to me. (Hand-me-downs for the win.) I wore that thing until it fell to pieces. Literally. I laughed. She was right. But I still got the shirt. It was on sale (hello!) and I think it will be comfortable to sleep in. And it might just be fun to get “the look” from her every now and then. So yes, I love my clothing bargains. I found a cool website, ThredUp, which is an online clothing consignment store. We found Aub several dresses at very good prices for her law internship. One day on a whim I typed crocheted top or something like that in the search box, as I found myself in something of a bohemian style mood. And I found this top. One of my favorite tops. I love it so much. I was in love. 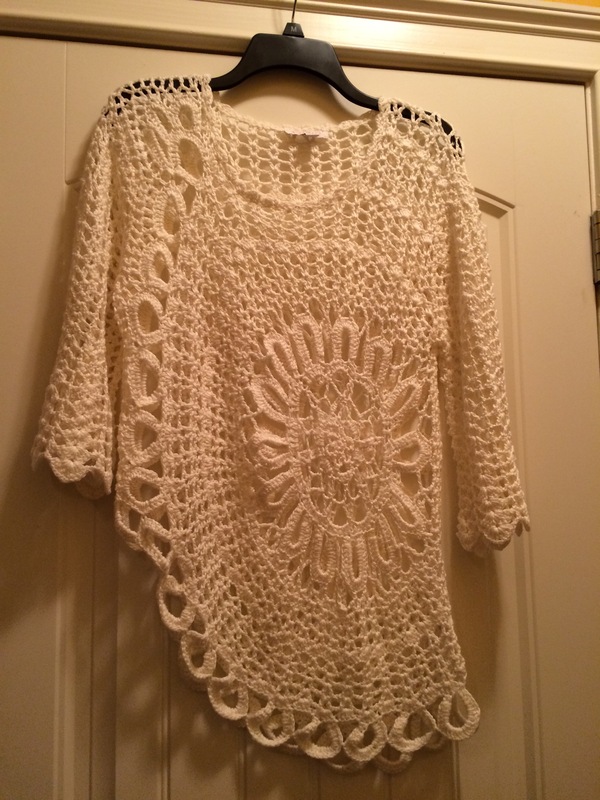 The color, a light cream, and the crocheted details and the asymmetry of it. LOVE. Because, if you haven’t picked up on it before, I’m a bit wonky and asymmetrical myself. I wore it last Sunday to Evening Prayer with jean capris and a coral colored tank underneath. Most days I dress for myself. I don’t mean that I dress myself (which I do) but, barring a glare from my girl, I wear what I enjoy. And I really enjoy that top. I burst out laughing. My friend totally caught me off guard. But she was so right. It did look like one of those doily type tablecloths from way back when. And with the asymmetry making it rounded, if it hadn’t had a brand tag at the back of the neck, I might have thought it was the best repurposed sweater EVER. Alas, though, it was just made that way. My sweet sisterfriend immediately backpedaled because she’s sweet like that and started apologizing. But I reassured her then and I am reassuring you now, girl, I love you. Thank you for that belly-busting laugh. The kind that erupts from you before you even know it’s happening. I LOVE THOSE KINDS OF LAUGHS. And I’m thankful when they happen and for the person who inspired them. The thing about my daughter and my friend commenting on my fashion choices is this. It doesn’t bother me that they had something less than flattering (I don’t know, could being compared to a tablecloth be considered flattering? Mayhap) to say about my clothing, because their commenting means they noticed. Me. They saw me, and they noticed what I had on. It also means they care enough and are comfortable enough in our relationship to say what’s on their minds. They aren’t being unkind pointing out my fashion faux pas–their sharing comes from love. And that’s a gift to be sure. To be known, to be loved anyway, and to be close enough that someone is comfortable sharing their truest thoughts. A gift I am so thankful for. Now that will be something worth talking about, don’t you think? May we all have someone who loves us and loves us well and keeps us on our toes, with sharing ideas, opinions, and lots of laughter. Because laughter really is the best. Smiling is good. Thanks for reading. I like that idea, Miss Sue. Maybe we can make that happen. I got all these buttons from Mama…..and I’m getting quite the collection of afghans from the GW. 🙂 I like the way you think.